I wrote the note below yesterday while on the ferry but I haven't got the chance to post it yet. We found out how incredibly lucky we were to get on that ferry. We were the 2nd-to-last-car on the boat, which turned out to be the last ferry of the night due to high winds (Adam had a flight departing at 6am this morning so that could have been interesting...). 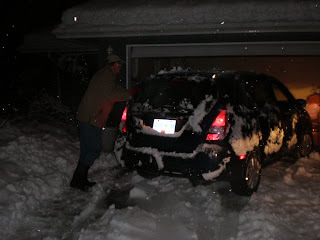 We arrived in Vancouver during a crazy blizzard but we didn't know how bad things were until we tried to drive up my parent's street. There was a bus stuck, partly blocking the intersection and a jam-up of impatient drivers behind. We were slowed trying to make our turn and that was it for my car. Zero traction to get up the minor 'hump' on the street but many helpful hands from the neighbourhood to push us...however, we wouldn't move an inch!. Thankfully Amanda and my brother-in-law, Rob had stopped by on their way back from Whistler and they came down the street in the truck to tow my little blue guy up the street! During dinner we were entertained with a light show, sparks flying from the power lines and transformer across the street.... not good..... Within an hour the power was gone and it was candles and down jackets for the rest of the night! We’re off to Vancouver again; Adam flies back to Freddy Beach early, early tomorrow morning, and I am in town to say a tearful goodbye and to sort out my Brazil visa situation. After some stress and serious doubt over our visas, it turns out I will be able to race the Fast Triathlon next weekend. Visa pick-up is on Tuesday and our flights are on Wednesday so it looks like everything is going to work out just in the “nick of time”. It’s been quite a process to obtain the visas on short notice but having a contact inside Brazil has made all the difference. I guess we found a loophole through the system and the sign at the Vancouver Consulate isn’t quite as serious as it sounds: “15 Days for Visa Processing. No Exceptions. DO NOT INSIST!” I never would have guessed a 2-day turnaround would be possible, but the stars definitely seemed to align for us at the right time last week. Christmas in Vancouver was great and the “kids” (Amanda, Rob, Adam and myself) successfully cooked a turkey dinner for 13 people. We even managed to make it fairly healthy and tasty (apart from the gravy, which we could not stop my sneaky Dad from making in the basement kitchen). Boxing Day was GREAT. Amanda again put my shopping endurance to shame and I was the wet blanket, pulling the plug on the sales on the early side (after 4 solid-hours). I was close to bonking at this point and made an emergency stop at Japadog, a very famous Japanese Hot Dog stand on Burrard Street. I don’t know if it was because I was freezing cold and starving, or if it was actually delicious, but I loved it. Who would have thought pickled daikon and sweet soy sauce on a turkey dog would be good?! Amanda ended the day with a severe case of “shopping arm”. Similar to tennis elbow, or runner’s knee, but an ailment that occurs when you purchase more than you can carry. By the end, I had my Japadog in one hand, and twelve of her bags in the other. This was also the day of another incredible snowstorm that caught a lot of the city off guard. I think my car is pretty good in the snow, but we had to overcome some hills to get back from downtown and it did not go well. The speedometer showed about 60km/hr but I think the speed was more like 2km/hr. The undercarriage of my car sure did get a good cleaning though :-) And, for the first time since I was thirteen, my dad had to drive me to the pool and wait in the stands while I did my swim!! Thanks, Dad! Number 1: I am REALLY looking forward to some change in weather. Brazil and Maui should do the trick. Number 2: My body is getting a little tired these days! I enjoyed my break over Christmas but Joel has cracked the whip, starting the New Year with a 5k road race. That sure forced the “pipes” open again! The race next weekend will be another opening of the pipes, but more on that later. We only have another thirty minutes on this boat and I am eyeing the new trashy celebrity magazine in the lounge!